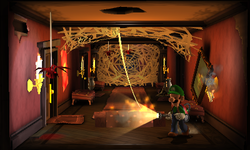 The Master Hall (Upstairs Corridor in PAL versions) is a room in the Gloomy Manor in Luigi's Mansion: Dark Moon. This area is accessed by taking the door on the left on the second floor of the Foyer. The Master Hall is a hallway that, for most of the missions, has part of its area blocked off by a large spider web. The bottom door on the left takes Luigi into the Parlor while the middle door takes Luigi into the Bedroom. The Rafters are accessed by pulling on the cord behind the spider web, although that room can only be accessed during Mission A-5. In A-5: Sticky Situation, the Master Hall is one of the few rooms that is always covered in spider webs. This page was last edited on May 1, 2017, at 21:04.